Few people realize seaweed has more protein than most meats, and tends to be rich in vitamin C. And with rare exceptions, seaweeds are non-poisonous, though not all taste equally good. 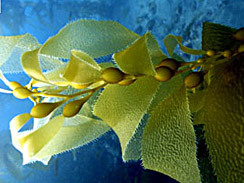 But it’s important to understand that seaweed tends to absorb pollutants, so make sure you harvest from clean water. Living in Los Angeles, I would never harvest near city beaches or fresh-water run off. For me, this means beaches north of Zuma, which regularly rate among the cleanest beaches in all of California. Seaweed tends to anchor itself to rocks, so I target beaches with tidal pool action. Some foragers recommend harvesting only seaweed that is currently anchored in the ocean, using a knife to remove an upper portion of the plant, leaving the anchored portion behind for new growth. I personally have had good luck harvesting kelp floating free in the waves. With nori, I removed it at low tide from rocks growing close to shore. 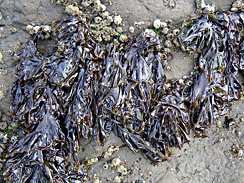 Collect seaweed at low tide, or whenever local conditions lend themselves to easy access. At home, wash in consecutive cold water baths until all sand and debris is removed. At this point in the process, you may want to prepare one final bath of fresh clean water, add some salt for flavoring, then submerge the seaweed. It’s not necessary, but adds a little flavor. 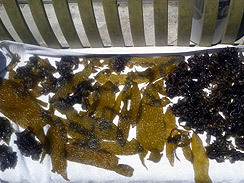 Lay clean seaweed in bright sun to dry. 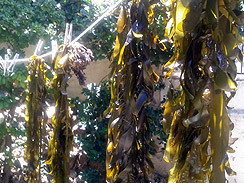 Long strings of seaweed can be pinned on a clothes line, while smaller leafy pieces can be laid out on clean towels. 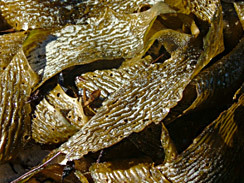 On a hot dry summer day, your seaweed can dry out within 1-2 hours in direct sunlight. When completely dry, you may choose to break your seaweed into smaller pieces. 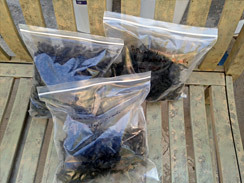 Place completely dried seaweed in air-tight containers; I used large ziplock bags. There are endless ways to use seaweed. You can pickle kelp tubes in acidic liquid, grind and powder dried seaweed for use in soup bases, or add fresh seaweed to egg scrambles or fried potatoes. Honestly, the list goes on and on. You can try light sprinklings of various seasonings on seaweed before laying out in the sun, then using as snack food when dry. I really enjoyed lightly salted kelp floater-bulbs after they’d dried in the sun; they look cool and I loved the popping crunch.